Trevor D'Arcy and Nick Livingston are driving up the winding road to a lake. The air is thick with the scent of barbecue and wood smoke, but they aren't going to the reservoir to cook, kayak, fish or camp. They're going there because they're geocaching—looking for hidden containers filled with tchotchkes using the Internet and GPS technology in what is essentially a thousand-man Easter egg hunt. Geocaching became possible when the U.S. Army made its powerful global positioning system (GPS) technology available to the public. Dave Ulmer of Beavercreek, Ore., decided it would be fun to bury a bucket full of stuff in the middle of a field and then post the bucket's coordinates on the Internet afterward. He did. The bucket was found in three days, and geocaching was born. 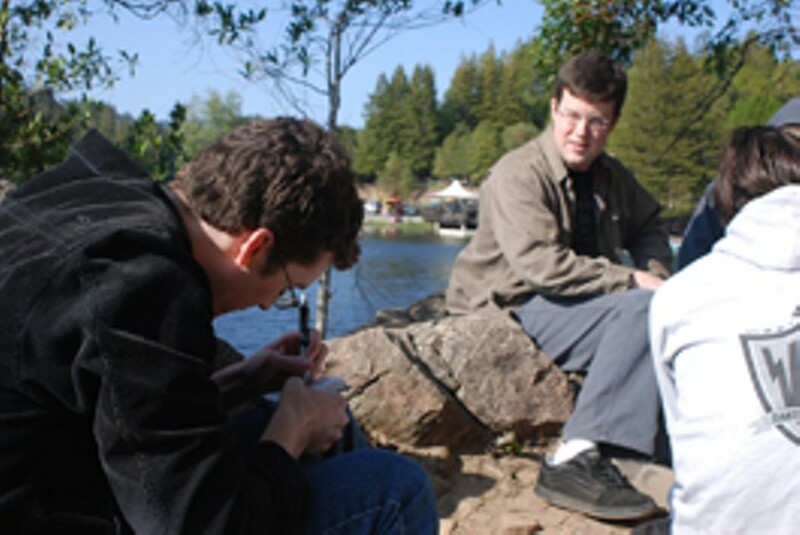 Now, eight years later, geocaching is played by legions of the technologically savvy. They're using Internet bulletin boards and GPS devices to find geocaches—usually stored in Tupperware, but also sometimes in military surplus containers—and they're posting the coordinates for other people to find on websites like www.geocaching.com, www.navicache.com or www.terracache.com. Geocaches have been hidden all over the North Bay. For something so common, almost no one knows about them. That's because they're hidden so well. Some of the slyest of the sly will put their caches into things that people wouldn't ever consider searching. One North Bay cache is a metal tube attached to a metal statue with a magnet. One legendary geocacher buys sprinkler heads from Kmart, puts geocaches in them and then puts them in public parks. Another local geocacher puts them up trees. There's one above the Arctic Circle. They're underwater. D'Arcy and Livingston are after a three-part geocache with a cheesy Arthurian legend theme. They're discussing how they're going to get to the island in the lake where a geocache is supposed to be hidden, when park ranger Josh Laeder interrupts to tell them that the cache has gone missing. Someone found it, he says, and took it home. This happens. It's not unusual for people who aren't actively searching for caches to stumble on them, especially the caches that are poorly hidden or hidden by people who think it's a good idea to hide bomb-shaped caches in conspicuous places. One of the stupider examples of conspicuous geocache misconduct took place on Nov. 7, 2004, during the presidential elections when a large, bearded man named Jay Furr tried to hide a cache around the perimeter of the Los Angeles International Airport. His "I was hiding treasure for people on the Internet" defense didn't fly with security. However, geocaching is fun and safe as long as one obeys the law and remembers not to cross Homeland Security. Laeder says it's mostly parents who take their kids up to look for a cache, and that it's mostly the hairy survivalist types, not geocachers, who get in the way of the park authorities. D'Arcy and Livingston ditch the plan to get onto the island and head out for the next cache, located on a peninsula at the farthest edge of the lake. They find it hidden in a niche in a rock; inside it is an array of odd stuff: a piece of paper with a story about Merlin, lots of little pieces of Lego toys, a quarter, a stamp and a metal washer. Also in the container is a little logbook with the times and dates of the cache find. According to the logbook, someone else found the cache just a few hours earlier. The two head off for the next cache, which is described as being hidden in plain sight, and spend the better half of an hour looking for it, but this cache, too, has gone missing. D'Arcy remembers a post on the Internet describing the cache as very easily found, which throws up a red flag for him. Figuring it's probably been stolen, they head home. In D'Arcy's apartment, a discussion follows: even though two out of the three caches were impossible to find, something was accomplished. There's the satisfaction that comes from knowing that there's someone on the Internet who is hiding things, but not well enough to hide them from you. And there's the pleasant knowledge that there's a group of adult people who don't know each other but play hide-and-seek with little pieces of plastic and military hardware. Nothing wrong with that.